Making the right food choices is one key to staying fit and trim. As they say, you are what you eat. Do you know what and how much you are really eating? Most people don’t, that is, unless they pay attention to the food nutrition and serving labels. But, even then, reading food nutrition labels can be a challenge to understand. They are all different, and it can be hard to identify how food companies define a serving. 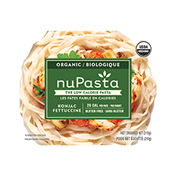 Since we are in the “pasta” business, we decided to take a more in-depth look into pasta nutrition and serving size labels and compare them to NuPasta. If you are looking to cut calories and be more conscious about what you are eating, you are probably curious about the serving size of pasta. What most people quickly realize is that comparing your options is not as simple as it should be. “1/2 cup of cooked pasta,” “125mL of cooked pasta,” “210g of cooked pasta,” “90g of dry pasta,” “a serving of pasta,” “a meal portion of pasta” – which one is right? These terms are confusing, and depending on the brand you choose, they may define their serving in a different way. This is tricky because none of these definitions of a portion size is incorrect. Whether it is measured by volume or by weight, and whether they use dry or cooked pasta, there is no right or wrong here. You just need to know that both are used and be aware of it when making meal choices. 1) How many servings should I eat for a meal? 2) How much dry pasta would I need to make 1 serving of cooked pasta? 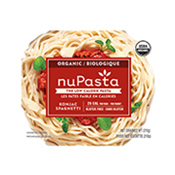 3) A package of dry pasta has a Nutritional Fact Table based on 90g… how many servings is that? The recommended meal portion for an average adult male is 3 servings of pasta, which is 210g. 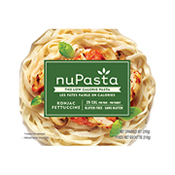 This is why one package of NuPasta is 210g. 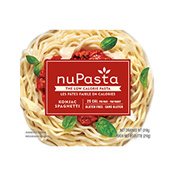 Since our Nutritional Fact Table is based on 210g of NuPasta, you will know exactly how much nutrition you are getting from your meal in one pack. No calculators, measuring cups, scales or mathematician required. 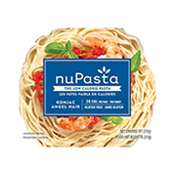 One package of NuPasta is equivalent to one meal.